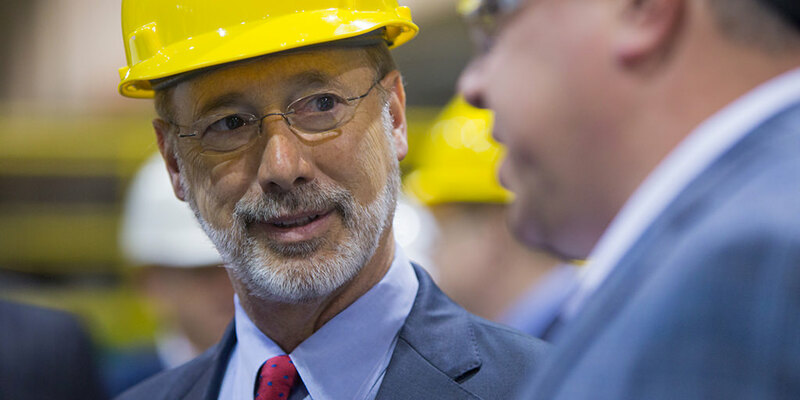 Harrisburg, PA – Governor Tom Wolf today announced the approval of 15 drinking water, wastewater, storm water, and non-point source projects across 12 counties through the Pennsylvania Infrastructure Investment Authority (PENNVEST). Reade Township Municipal Authority received a $1,570,000 loan to replace approximately 1,350 feet of distribution line, 8,750 feel of raw water transmission line, and 420 residential meters. Falls Creek Borough Municipal Authority received a $1,329,200 loan and $670,800 grant to construction an interconnection with the City of DuBois, a control meter vault, pressure reducing valve vault and 12,600 feet of water transmission line. West Taylor Township received an $856,623 loan and $343,377 grant to rehabilitate sewer lines, manholes, and extension of service. Brockway Area Sewer Authority received a $2,993,603 loan and $1,510,765 grant to upgrade components at the wastewater treatment facility, replace sewer lines, pump stations and force main. Lake City Municipal Sewer Authority received a $4,612,000 loan to upgrade and expand their wastewater sewer facilities, provide a new lift station and force main. This project supports the retention of 420 local commercial and industrial jobs. Bradford Sanitary Authority received a $4,652,200 loan and $2,347,800 grant to construct two new aerobic digesters, new chlorine building, extended outfall diffuser, sludge dewatering, belt filter presses, activated sludge pumps and other related treatment facility rehabilitation and upgrades. White Oak Country Estates Property Owners Association received a $775,000 loan to construct a new pre-cast concrete in ground package plant. Homestead Borough received a $1,209,656 loan to install green infrastructure in a partnership with Steel Valley School District. The project will capture and infiltrate all the runoff form the site through the installation of four infiltration trenches with 18,900 cubic feet of storage. Mount Holly Springs Borough received a $1,640,650 grant to install approximately 2,088 feet of storm sewer pipe, 245 feet of grass drainage swales, installation of 26 inlets and installation of one rain garden and adjacent bollards. Bangor Borough received a $1,986,826 grant to eliminate the existing slate box culvert and replace it with a 66” storm sewer adequately sized to convey storm flows and prevent further property damage. The funding comes from a combination of state funds approved by voters, federal grants to PENNVEST from the Environmental Protection Agency, and recycled loan repayments from previous PENNVEST funding awards. Funds for the projects are disbursed after bills for work have been paid and receipts submitted to PENNVEST.